It was one tough winter in the heart of America, it is almost over let’s all hope. We will be headed back the end of April and looking forward to seeing old friends and family. We enjoy the tropics and the warm weather but there is no place like home. Here in Florida it is the real melting pot. I say with pride being a Midwestern boy we are some of the nicest folks on the planet. There are some friendly easterners but don’t light a candle to you and me. It seems New Jersey lost over 2 million residents the last 10 years due to high taxes sound familiar? I think they all came here to SW Florida. I don’t have to elaborate on these people I think you already know if you have ever been out east. But that being said it will be refreshing to open a door and the person you opened it up for will say thank you. The Midwest is the home of yes mam, no mam please, thank you, good morning; good night have a nice day and all the other things we were taught as children. In 1940 the population of Florida was under 2 million and in 1980 was 10 million and today it is nearly 22 million. It has become the 3rd largest populated state in the union and a 1000 people on an average move here every day. There is plenty of room in the middle where you can drive and hardly ever see another vehicle. Everyone wants to live on the coast including me and Cathy. We love it here but certainly miss those smiling faces of the people of Illinois. See you soon. Just because you live 1300 miles away your life back home is only phone call away. It seems being my age and knowing a lot of people it’s not unusual to get calls you wish didn’t get. My passion for hunting, fishing and just the outdoors like your experiences started when I was young. 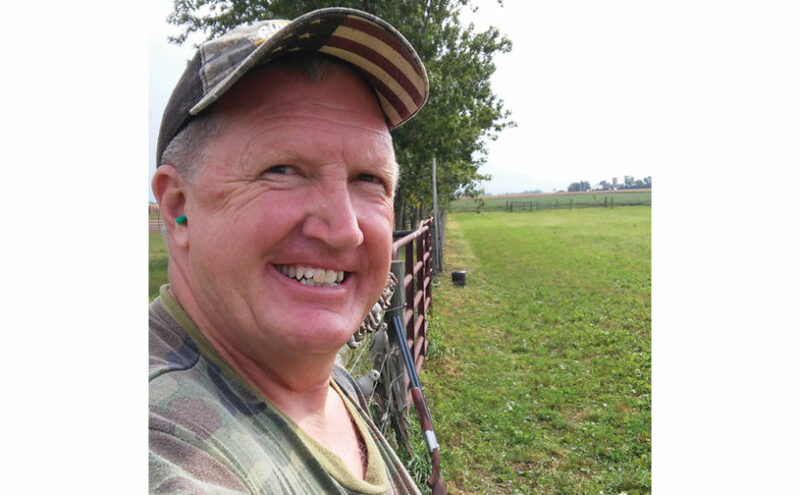 My childhood friend Clay DeMaster, who I hunted everything from squirrels, rabbits, quail, pheasants, doves and especially ducks and geese passed away in March. I hunted morel mushrooms for the first time with Clay when they were everywhere and we the filled bags full. Clay and I trained Chesapeake’s and Labs together for many years. We also ran our dogs in field trials. I got a large male Chesapeake from Clay that weighed over 110 pounds and was he a retriever named Jake. He could break ice for a quarter mile to get a duck he also took first place out of 15 dogs in the puppy stakes. We hunted ducks all over the state but spent most of our duck shooting when we were young on the north end of Clear Lake in Mink Slough just below our cabin on Durang hill. We had a lot of fun and if I could go back in time I think this is where I would go. My mom would leave us at the cabin for 2 or three weeks at a time in the summer. We had just the basics, cans of beans, flour, salt and pepper, odds and ends. We shot ducks, squirrels, rabbits and whatever we could find. The first time I ever used a lure was on Spring Lake with Clay, we were about 12 at the time. He caught some trout that were stocked and not legal to keep so we hid them on a stringer in the Pike Hole. When we came back that night to get them a turtle ate ‘em all. I had a small 12 foot boat with a 3 HP Evinrude kicker. We went to Watkins Popular Acres bought a 12 pack of Coke for a dollar and drank all of it before we got back. Went sugar crazy that day for we hadn’t had any in weeks. We had about as much fun growing up as any two kids could, the stories are many and I could write for hours but I think you got the idea we had a great time. As we got older and married and both had children we had responsibilities and our lives changed. We stayed in touch and got together when we could. His dad Jack and my dad Jack were close friends for many years. Clay has had some health problems over the years and has not been real active outdoors like he used to. He and his wife Kim were doing well enjoying retirement and it seemed he was doing a lot better. But that wasn’t the case and another good friend has gone away. I’ll miss those conversations talking about all the fun we had when we were kids. I’ll keep those memories close to my heart till it’s time to go. Clay was a special guy and I know his wife Kim and his family will miss him deeply. Be sure to stay in touch with those old friends there not here forever and neither are we. Clay was 67. This editorial has become a bit of an obituary, but I think these people are worth telling about and they would be proud if I did. Another old friend from Fulton County died in March. As you can see in the picture see Steve Clark with his dog Buford. We spoke on a Wednesday and he died the following Friday of colon cancer. We were successful finding a home for his dog. Steve managed duck clubs up and down the river and was a heavy equipment operator. A former Marine and close friend and we will all miss Steve. He was my age 65. Dutch Stovall of Manito passed in March. He was a mentor to me and a great Chesapeake dog man. He was one of the best in the country. Dutch was a tough guy but had a kind heart. He worked on the railroad most of his life and was a diehard duck hunter. I have many stories about old Dutch. He was a good friend of my dad’s, a friend of mine too and an Uncle to ASO Writer & good friend Deb Park. I took him on his last duck hunt several years ago. Dutch was 90 years old. There are others who are ill one good friend with a brain tumor, Tyson Johnson. I called him last night and his dad Alan said he perked up for the evening. His dad called me medicine man. All these people are my friends and I love them all. I’m proud that I can call each and every one of them my friend. That feels good. Kids Kids and More Kids! Another day, another kid! Just how lucky can an old bowhunter get than constantly receiving one of the greatest joys available in life; hearing from kids from all over America every day celebrating hunting and the great outdoor lifestyle in this otherwise crazy day and age! Not a day goes by that I don’t receive a letter and photo from a young boy and or a young girl with exciting celebrations of a successful hunt. Think about that one for a minute. In 2019 in the bizzarro goofy world turned upside down with our purest American cultures and heritage being attacked from every angle every day, I get photos and stories from young Americans absolutely thrilled to have whacked their first deer, turkey, bear, rabbit, dove, duck, squirrel, pheasant, racoon or any of the various species of big and small game in North America. Boy, if that’s not the ultimate statement of politically incorrect, I’m a gay one-eyed socialist banjo player in an all transgender vegan country band. One way or another, these kids and their parents track down good old Uncle Ted and rave about their own thrilling “Spirit of the Wild” adventure joyfully sharing all the amazing details of their magical hunting moment with mom, dad, or other family members. You can feel the happiness and glowing energy as if you were right there at their side just by looking at the pictures of them grinning ear to ear with some handsome dead critter. Most of their stories include the ultimate FUN exaltation of “whack ‘em and stack ‘em” or any number of the unambiguous battlecries coined by old happy go lucky Ted FUN Nugent. More proof of course that fun is and always has been and always will be the defining carrot for youngsters to take up our beloved hunting lifestyle. That is so cool I can hardly stand myself. If you are one of the many millions of facebookers that chime in on my Ted Nugent facebook electronic campfire each and every day, you can witness the onslaught of happy children that love to hunt as much as any of us. Some of these little hunting kids are as young as five years old, and miracle of miracles, even teenagers are hard at it honing their pure reasoning predatorship touch and skills. With the longrunning propaganda ministry of hateful, anti-hunting fakenews media, vicious anti-hunting Hollywood insanity and a soulless academia for the most part, busy filling America’s youth’s minds with nasty anti-hunting, anti-gun, anti-nature drivel, it is nothing short of phenomenal that we continue to recruit new hunters in this country at all. But lo and behold, I witness it every day and wish to salute and thank all those great parents out there that continue to educate and nurture their children to the truth, logic and commonsense of the essentiality of hunting, fishing and trapping as the only real wildlife conservation that has always produced healthy, thriving wildlife and wild grounds. Somebody shout “Hallelujah!” out loud like ya mean it! Let this be a lesson to all hunting families out there, that genuine effort should always be put forth to include our children, grandchildren and extended family and neighbor’s kids in our outdoor fun. If we don’t do it, nobody else will and the dishonest negative powers that be will win the culture war against us. Let us all vow in 2019 to try harder, push harder and strategize as cleverly as we can to get the young’uns out there with us. 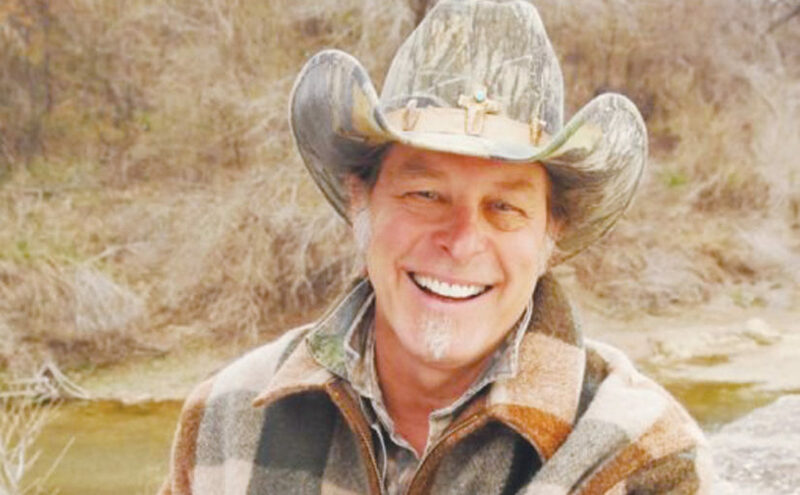 As we throttle forward with our 31st year of Ted Nugent Kamp for Kids, the jury is not still out! The kids love it, the kids need it, and the kids will pursue it as long as we put forth that extra effort to make it happen. 2019 is the year! Take the kids with you. It will cleanse their souls and make America great again one future sporter at a time. Steam lifted from the still warm body as it lay. The crisp sound of the garbage truck alarm beep as he reversed direction resonated through the air. In the adjacent cul-de-sac, children, those whose mothers forced them to stand and wait for the bus rather than let them keep warm in the family BMW awaiting the arrival of the School Bus were chattering as children do. At least those without Smart Phones still made rudimentary vocalizations. The participant was euphoric over his success this morning. The one-hundred-yard walk through the fringe timber to his truck was made without breaking a sweat. The surrounding flat farm ground had long since been harvested with the fall application of anhydrous ammonia already completed. Only spring would bring life back into the field for farming purposes. Fringe growth or black timber was the only elevated ground life in this area and only in areas close to the subdivisions or drainage ground unsuitable or as of yet uneconomical for farming, usually one and the same. Half way through the walk the sound of a vacuum cleaner could be heard briefly when the door opened from one of the homes and the truck motor firing up as one of the occupants left. Surely, this animal had heard these sounds numerous times and knew each individual dog bark and smell from human activity. These sights and sounds posed no alarm unless close or in an unusual location! In the past, the state would limit hunting seasons in this county for fear of too many bucks being taken as the small percentage of fringe along fields and rivers made hunting the animal too easy! Back to the truck, the individual could not wait to text his compadres with the pictures of this mornings’ activity. No hurry, the ground would support his four wheeler used for retrieval. Human assistance would not be necessary other than for the purpose of gloating over his primal undertaking! The deceased animal normally worked these areas under the cover of darkness but this morning the primal push of testosterone through his blood stream and the female of his species in full breeding estrus dulled his recognition of the transition from dark to light. His non-recognition cost him his life! The origin of the bolt flight came from the tent blind erected in a position two weeks earlier so as to allow familiarity of existence. Widow Jones whose house touched the small fringe of timber could see the perpetrator of the blind exiting on most days at a fairly early morning time. She would feel the loss of a friend and a tinge of anger as she watched the retrieval process. She had enjoyed the animal’s previous visits, although most without her knowledge, through her yard to consume sunflower seeds scattered around and in her bird feeder and apple consumption as they ripened to the perfect state. Most visits had been under the cover of darkness. The visible gawk box, visible from her home, hung on a tree trunk probably gave this animal’s existence away to the interloper, she thought. How did the animal know the state of the apple crop but as a scent carried in the wind? The gawk boxes gave off no scent of forewarning! Five years had passed, from button to maturity, before his demise this day. Had this “human” killer survived in the cold of winter, heat of summer, human pursuit, traffic and the constant pursuit by the song dogs as her friend had! She knew the answer! For he had accomplished little but to shoot an instrument taking little or no skill or practice to end the animals’, dulled by close human interaction in his suburban life existence! She recognized this individual shooting numerous does during past seasons as if a demented need to exterminate the species lived within his cranial mass! Damn those box or tent abodes! No skill or accomplishment needed to occupy those structures, she thought! Widow Jones, having grown up on a farm, had witnessed and experienced the hardships and sometimes graphic details in real death! Her late husband, a Marine Combat veteran and provider through use of his hands and skill also was a hunter but he utilized a stick bow – then success was not measured in inches as the” hunter” in todays’ world often does! 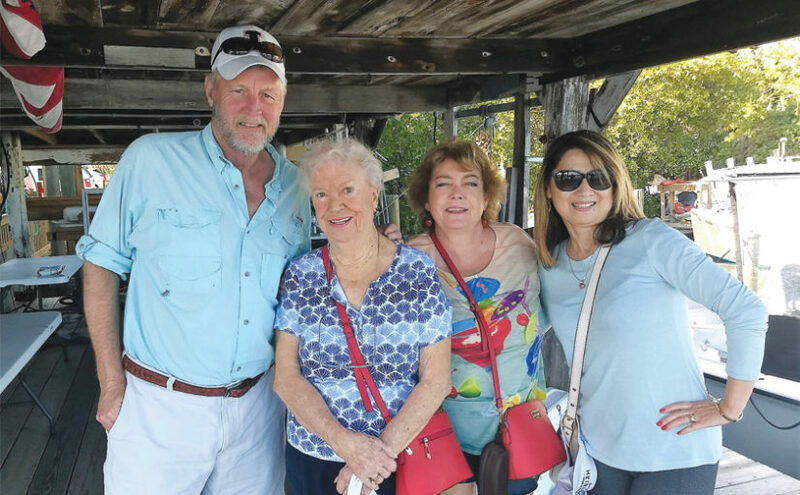 Hunting was a fact of life in her upbringing and married life, her husband had nailed the racks upon the wall on the back porch as reminders of past success. Concealment was in the form of non-movement and use of natural vegetation to keep the playing field equal between the participants in the woods was his strategy! The aroma from the automatic coffee maker and the electronic notification jingle signified completion. She touched the voice activation button on her remote to select a movie for her entertainment this morning. Not finding a movie to her liking, she punched through the channels, pausing on a “hunting channel” as the individual used a range-finder, grunt call, and scope mounted bolt launcher along with every conceivable gadget in the marketing of this activity before selecting the animal to shoot as three targets munched on pellets in the field as seen through the opening in his tent blind! Had the espied individual and the” You Tube Hunter” from this morning ever experienced the thrill of her late husband’s respectful manner? Several hours later she heard a knock at the door. Her Grandson had arrived to check on her status. He directed her to look out her window towards his truck to see the nice animal he had just taken. His arrival had been delayed from the hour long drive from the wooded hill county to the west and the time needed to drag the animal from the field. The stick hung on the gun rack in the rear window and his only gear was on his back in the form of his clothing. Her late husband would have been proud! The modern coffee maker sang the recognizable tune to signify brewing completion. Stay and tell me a real hunting story over a cup. Grandma, do you think Grandpa would be upset if I retired his old bow and shot a recurve? A tear came to her eye! No mention was made of the other events of the morning! 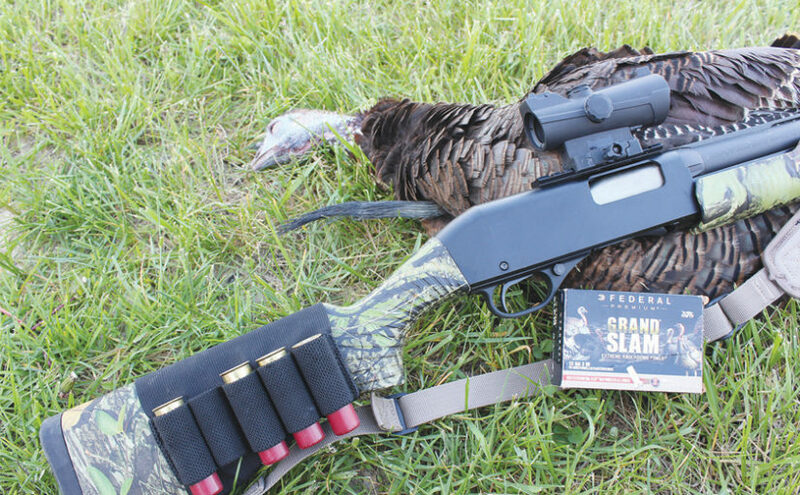 When it comes to the perfect shotgun for turkey hunting, what is the No. 1 thing that matters most to you? The opinion of most turkey hunters would be to choose a gun with good optics that shoots a tight shot pattern. Many optic companies offer scopes for the shotgunner. I recommend a scope that provides at least 3 ¼-inches of practical eye-relief, preferably 3 ½ inches. For those of you who do not know what practical eye-relief is, it is the distance between your eye and the scope. Low-power shotgun scopes are parallax free at 50 to 75 yards for close shooting. Be sure to purchase a scope specifically designed for a shotgun. You need a scope that can withstand the big bang punishment that a shotgun delivers. Scopes designed for rifles are not up for the challenge. A scope’s magnification at the three power allows you to get a good look at the gobbler, and it allows you to see any obstacles in the way that could prevent you from getting a clean shot at a turkey’s head. When it comes to accuracy, low magnification scopes is the better choice of other forms of sights on the market for the turkey hunter. In the beginning, the only options turkey hunters had available to choose from were the Improved Cylinder, Modified, and Full Chokes. At the time, we made do with what we had, but as turkey hunting has grown in popularity, we started seeing Extra-Full and Turkey-Full chokes. With these specialty chokes becoming all the rage, would one work with your gun and load? To understand shot patterns better, we first need to know how a choke does its job. The first thing that happens is that the shot moves from the chamber where the shell is held and into the barrel. This is accomplished by traveling through a short taper called a forcing cone. As the shot passes through the barrel, it will enter the choke, which is the last thing it does before leaving the gun. The reason the barrel is shaped like a perfect tube is to prevent disturbance in the shot column. When the shot enters the choke, the choke will crowd the edges of the shot column inward to tighten the shot pattern. Chokes can present problems if they are too tight. An example would be pellets pushing against each other. The result of this happening is a pattern that will have holes throughout it instead of a nice, tight pattern. It is possible that hunters will have an irregular pattern with some loads and not with others. It may occur with every shot or just occasionally. You will never know for sure when it will happen. The good news is that there is a simple remedy: shot size. Hunters will begin to see irregular shot patterns with a large shot like a number 4 and other large pellets. A choke that delivers a tight pattern with the smaller number 6 might have problems with the bigger number 4 in the way of leaving holes in the shot pattern. Large shot might even damage the choke itself. There is no room in my turkey-hunting arsenal for a number 4 shell, and I recommend that all turkey hunters stay away from the 4 shot. I am not trying to make anyone mad; all I am doing is stating my preference. Hopefully, turkeys will get to within 20 yards for the perfect shot, but when they do not cooperate, you will need to have a gun and a load that will reach out and deliver a punch with a tight pattern. Let’s face it, turkeys do not know what we as hunters expect from them, so we must be ready for anything. After you have your shot pattern to a point where you can no longer complain about it (correct choke and shot size), there are still other factors that will make an individual turkey gun comfortable to hunt. Autoloaders, pump, single, and double barrels are the choices of actions from which turkey hunters must choose. It mainly depends on what you have grown accustomed to over the years. Autoloaders is the first choice among many turkey hunters despite being more costly than other actions. With more and more turkey hunters shooting heavier loads, autoloaders are popular for being able to minimize a lot of the recoil. Chances are that hunters will not get a second shot at a turkey, although it does happen. Whatever happens, it is nice to know that you will have a gun ready to fire. For hunters who hunt other game with a pump-action shotgun, it is a popular choice among turkey hunters. I have used a pump my entire hunting career, and it has become second nature for me to eject a shell from the chamber. Often, I do it without realizing I did it. The last couple of seasons the Savage 320 Field Grade Turkey Gun has been my go-to shotgun. It is an affordable shotgun with the turkey hunter in mind. The gun features Mossy Oak® Obsession camouflage, an extended full choke, fiber optic sight, and drilled and tapped receiver. When combined when any of the Federal turkey loads it is a deadly combination. I have found that either Federal’s Grand Slam or TSS shoots best but as always, you need to pattern your gun to find the best shell for you. I have found that either Federal’s Grand Slam or TSS shoots best but as always, you need to pattern your gun to find the best shell for you. A double-barrel shotgun will allow a hunter to use two different loads, depending on the shot distance. In one barrel, you can have a load that will hold a tight pattern for long shots and an open pattern in the second chamber for shorter shots. Simply use the barrel selector to choose the desired load, aim, and fire. Single barrels are usually inexpensive compared to other actions and lighter, too. A hunter will only have one shot, but how often does a turkey hang around after you shoot? An easy fix is not to miss the bird the first time you shoot. A 12-gauge that is chambered for a 3-inch case is all the more that you need to kill a turkey. The 3 ½-inch casings came out because there is no room for lighter steel in the smaller 3-inch shell to give maximum performance. Most of the top shotgun makers offer specialized turkey guns. If you are loyal to one brand, chances are that you can find a gun to suit your needs. Of course, it will not hurt a thing to shop around a bit. Have a shotgun that you are comfortable shooting, a load that shoots a deadly pattern, and a sight that you feel will allow you to consistently hit the head of a boss gobbler. Put these three things together and you have a deadly trio. On Sunday, March 10, 2019, a pro-Second Amendment Rally was held in Effingham, Illinois, with 1602 people attending. I have never seen a rally this large and enthusiastic outside of IGOLD. The rally in Effingham is indicative of what is going on in Illinois outside of Chicago. When HR0101 came up, the resolution to separate Chicago from the rest of the State, the cheers were long and loud. It is not that Downstaters hate the people in Chicago, it is that they hate being ruled by Chicago politicians and their country bumpkin attitude toward the rest of the State. Chicago has a crime problem that is multiplied by not enforcing the laws already on the books. Instead, Chicago prefers making their crime problem everyone else’s problem. One of the obvious ways they do that is by trying to inflict Chicago Style Gun Control on everyone else in the state. Those same people promote their own hoplophobia neuroses about firearms, trying to make it the new normal. They try to make everyone afraid of firearms. Chicago exports many of their crime problems to other parts of the state. If you live in cities, villages or a town outside of Chicago, you have probably noticed your community has changed. The municipalities along the interstates are most affected. I live in an area that actually has a name for it, known as the I-55/I-57 effect. I live right between the two interstates; the City is exporting less desirable people into downstate Illinois. Now back to the rallies. The ISRA will be scheduling more rallies around the state. If one is held near you please try to attend and bring someone with you. I have often mentioned this is going to be a long and expensive fight. We need more people on our side. Please ask everyone you know to join the Illinois State Rifle Association. Congratulations to the people of Kentucky. The Kentucky Governor just signed into law Constitutional Carry for those over 21 with no criminal record. If you wish to leave the state you can get a permit. Kentucky is the 16th state to pass Constitutional Carry. Many immediately blamed the Illinois State Police for not doing a proper background check. That seemed unlikely since every FOID card holder goes through a background check every night except for a few holidays. The Aurora shooter had gone through many background checks, along with other FOID card holders, and nothing ever came up. The FBI began investigating. A letter dated February 28, 2019, to Christopher Wray, Director of the FBI, was signed by Senators Durban and Duckworth, as well as by Congressmen Foster and Underwood. The letter explains that the FBI inquiry discovered that either Mississippi law enforcement or the Mississippi court system failed to report the arrest or the conviction of the Aurora shooter to the FBI for inclusion in the Criminal Justice Information Services (CJIS) data base. That is the reason why the ISP could not find the information on the shooter, it wasn’t ever there. The Gun Sanctuary movement is getting more traction across the country. In New Mexico, the sheriffs in half the counties are refusing to enforce the unconstitutional draconian gun laws. This has caused the anti-gun Governor of New Mexico, Michelle Lujan Grisham, to throw a Facebook hissy fit. Too bad. Similar movements are reported in Oregon, Nevada, Delaware, Maryland and Washington State. Hopefully, this will deepen in the states where the movement is now and spread across the country to every state. There needs to be a huge backlash culminating around the time of the 2020 elections. One of the more popular classes the ISRA sponsors is the M1 Maintenance Class. There are a lot of these historic rifles out there and people love them. I am pleased to announce that on April 13th, 2019, we will again offer this class. These rifles, with blank adapters, are used in thousands of Military funerals each day. There will be a section on rifles with blank adapters included in this class. Space is limited. Please check the ISRA website or email laura@isra.org. Actor and personal acquaintance R. Lee Ermey was snubbed by the Oscars in their Memoriam Segment on Sunday night. R. Lee Ermey started his movie career in “Apocalypse Now” and went on to star in “Full Metal Jacket” and appeared in several other films. Ermey had a couple of TV shows, “Mail Call” and “Lock n’ Load”. Ermey was a dedicated NRA Board Member. R. Lee Ermey died in April, 2018 and is buried in Arlington National Cemetery. He was 100% Pro-American which is probably why Hollywood passed him over. One of the expected outcomes of the Aurora shooting was that someone would propose that every FOID card applicant and FOID card holder be fingerprinted. Sure enough, habitual anti-gunner Kathleen Willis (D-77 Chicago) proposed the idea. There is not a bill at this writing but I am sure there is one in the works. The ISRA opposes this idea on its face because it clearly is an out-and-out attack on the Second Amendment, a fundamental right. Moreover, the costs to individual gun owners would be staggering. There are, in round numbers, 2,260,000 FOID card holders in the state. Now the estimated fingerprint cost to the FOID card holder is between $100-$120. If we use the $110 amount, that would be $110 X 2,260,000=$248,600,000. That is nearly a quarter billion dollars, not including the hidden costs, to exercise a fundamental right. I don’t think so. Then we would have the costs of staffing for the Illinois State Police, space allocations, equipment costs and who knows what else. Any proposed legislation is more likely to attack law-abiding gun owners rather than fix the problem. For some legislators, their real goal is to attack law-abiding citizens, using this event an excuse. We must all remember that the criminal is the cause, not some data entry person that missed a key stroke. The other thing we need to remember is that this was a Gun Free Zone. The only thing a Gun Free Zone does is make the criminal safer. The laws we have on the books are more than adequate, what we need to do is enforce them. On Monday, in USA Today, Willis said it doesn’t do us any good to tighten up our (gun) laws if we are not following through to make sure they are enforced. Yet, she is more than willing to push the fingerprint idea. FOID card holders go through a background check every night with the exception of Thanksgiving, Christmas, New Year’s, Easter and the 4th of July. The shooter’s record was passed over again and again in the National Instant Check System (NICS). The Illinois State Police finds many things on those background checks but never this guy’s record? Maybe there was an error in coding his record in the NICS or maybe there was a corrupted file and no one caught it. The point is that we don’t know but we should find out before we go forward with Legislation that does nothing but attack law-abiding gun owners. To say the FOID card system doesn’t work is a mistake. There are about 10,800 FOID cards revoked in a year. Of these, 2500 are revoked for mental health reasons. Others are revoked because people move away or pass away, the rest are revoked for cause. The FOID card system is not liked by many but it is here to stay, I think. Prior to 2014, the FOID card system was understaffed so people were waiting months to get a FOID card instead of the required 30 days. In my opinion, Governor Quinn, who did not like guns or gun owners, deliberately understaffed and underfunded the system to make it tough on gun owners. At one time, the staff was only at 45% of what was required to operate the FOID Division. The computer system was so old there were only a few people who could work on it. The old computers used FORTRAN if anyone remembers that long ago. Things did not improve until 2014 when money from concealed carry licenses funded a new system. The new system was being put in place at the very time the Aurora shooter was applying for his FOID card. I don’t know if the stress of the time played a part in this situation but it could have. If the FOID system had been funded all along this might never have happened. As I write this, no bills are moving in Springfield. This could change quickly. The $15.00 minimum wage bill is a good example. It only took six legislative days to put that bill on the Governor’s desk, start to finish. That is why the ISRA is in Springfield all the time. 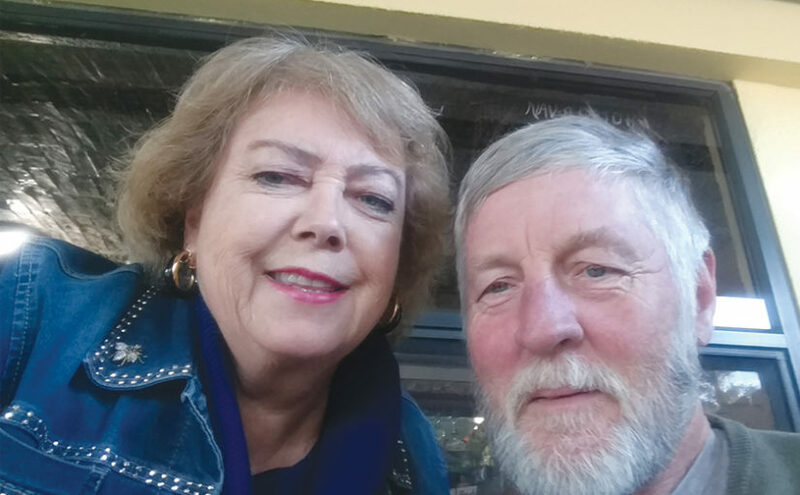 Last month, Bill Potts and I were at the Bloomington Gun Show. We gave four legislative updates. Mary Mills and Laura Hack were there from our office to answer FOID and Concealed Carry renewal questions. For those who don’t know, the ISRA will help those members, at no charge, who are having to renew either their FOID or ICCL. Thanks for all those who attended. The turnout was great. All of this takes a great deal of money and members. I want to thank all those who are members, all those who have recently joined and all of you that will join. It is important to remember that the anti-gun crowd and the politicians who push their platform are not going to go away, and neither are we. It is important to join and renew your membership so that we can stay in the fight. Recently, people have been becoming life members or upgrading their memberships. That is great although I understand not everyone can to do that. I appreciate all of your support. Well here we are another month has passed and all I can think about is fishing. Ten years ago, you couldn’t have convinced me to go ice fishing if you paid me. Then of course my friend Al happened. He finally convinced me to get on the hard water with him and happily spread his addiction. Don’t get me wrong I love hunting season, but fishing is something you can pretty much do year-round. So, after my hunting seasons are over, I pray for the hard water. Some years it seems we have plenty then other years it is here for a few weeks and gone. Last year I was only able to get out a couple of times. So, I decided if we did get ice this year, I would set aside a couple of days and fish. After the crazy weather we have had in Central Illinois we finally had some good ice and I decided I was going to take four days and fish every day. Of course, with Al I knew I would have at least one partner in crime. As we watched the weather it was calling for -45-degree windchills on Wednesday and we had our heart set on fishing Thursday – Friday. I say that the temperature was only going to mildly better on Thursday, but I thought that is why we have a hut and heater so let’s be the only crazy people to venture out and go fishing. I mean even the postal service canceled deliveries and we decide “let’s go fishing!”. We rounded everything up Thursday morning and headed for a strip in Farmington, IL. We knew this location would be protected from any wind and the ice would be more than thick enough for us. We stopped for breakfast trying to stay warm for as long as possible. We were finally on the ice around 9:00am and it didn’t take long to start catching fish. I really didn’t think we would fare well with the weather conditions, but we caught some crappie, bass and bluegill to keep us entertained. We had a great first day and thought man with the weather heating up it should only get better. Day two came around and we decided to try something new. We went to a public location that I have heard great things about for years but never gave it a real thought for ice fishing. We arrived early Friday and started trying to locate fish. It took us a couple of hours to find some deeper water but when we did, we caught a couple of very nice crappie. I am happy with a 10” crappie and we had one a little over 10” and two over 12”. I need to send a special thank you shout out to James Thrasher. We met him on the ice, and he was very gracious with his information. I know many fishermen keep their information to themselves, but James offered up a lot of valuable information that helped us catch fish. I appreciated his willingness to share. Even though we had a slow day I was bound and determined to return here on Sunday. It was going to be 50 degrees and the bite should be on. Day three we received an invite from Mike O’Bryan’s Irish Acres and of course there was no way I was turning that down. See, when you go fishing with Mike it doesn’t matter whether you catch fish because no matter what you will have a great time and good food. We arrived early Saturday morning to get a jump on the fish. I was 30 degrees and it felt like a major heat wave. As we usually do at Mike’s we started catching a few fish right off the bat. The bite was extremely light but if you could pay attention long enough you could catch a few nibbling on your worm. As the day progressed several groups started to show up. First it was Joseph’s Rick, Mike, Mike and Nate. When you see them roll up you know its time to start laughing. As the day progressed several more people joined the group and one friend I haven’t seen since my event days… Jim Weatherington. It was awesome to see him and catch up with him and the rest of the group. The bite was not crazy, but we did get a nice mess of fish that ended up in my fryer. At the end of the day all that matters if you had a great time with friends and have a few potato chips in the fryer. Thanks, Mike O’Bryan, for the invite and friendship. Day four rolled around and I felt like I was hit with a Mack Truck. It felt as if I had been duck hunting for seven straight days in North Dakota, but there was no way I could sleep in. It was the last day before having to get back to work and the land of the giant slabs was waiting. We arrived on location at day break. We wanted to be the first on the ice and we had a mark of where we wanted to fish. When we arrived, there was one group on the lake and we didn’t think anything of it. As we walked to our coordinates, we realized these guys were fishing the exact location we wanted to. What are the chances? We decided to give them a little room and drill some holes along the same deep ledge. As the day went on, I watched the gentlemen in front of me pull 6-8 nice crappie out of the hole and all I could think about is that could be me. After four or five hours of catching one fish the gentlemen in front of us had to leave so we took over their holes. Unfortunately, we didn’t get many bites until around two. Then all of the sudden we received several spurts of fish and the next thing we know is our group had 12 – 14 nice Crappie. Nothing to go crazy about but when some of the Crappie are over 13” it doesn’t take many to make a meal. 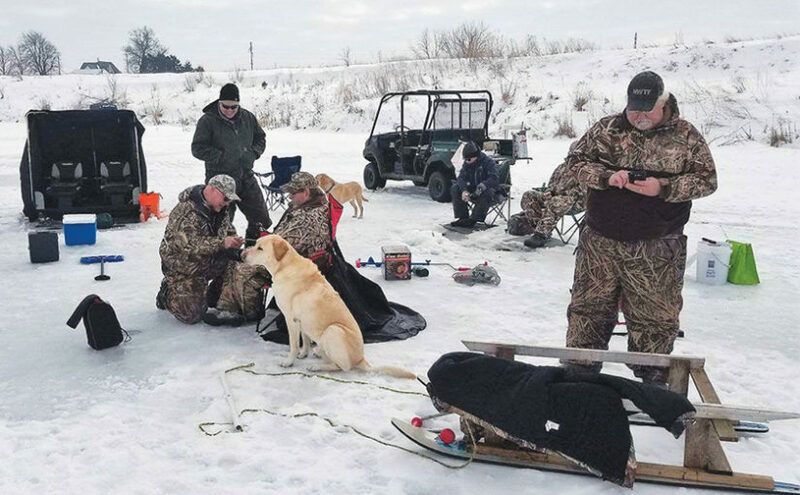 We may not have hammered the fish over our four-day ice fishing extravaganza, but boy did we have a good time and it was worth every minute. It’s been a real tough winter everything from snow, rain, ice, wind and unbelievable cold weather, it was nearly 50 below with the wind chill. But there will be a turnaround in a few weeks let’s hope. One good thing I heard the ice fishing has been better than ever and will go into March I believe it was real thick this year. Andy has been tearing them up at a number of local strip mines and has plenty of fish for a fish fry. Nothing like cold water bluegills, bass and crappies fried in the grease. I love eating fish and I like them all. We have been enjoying the weather here in Port Charlotte Florida with an average high near 80 nearly every day. The coldest it has gotten at night and early morning is 46 but a quick recovery to the high 60’s. I was able to go on a deep water fishing charter 45 miles out into the Gulf. The youngest Licensed Captain in the country. Tyler DeGraff of North Port Florida has been fishing since he was in diapers. This young man is 18 years old and knows the fishing game here in South West Florida like no other Captain. Offshore fishing out of Venice, Englewood & Boca Grande. We hit a day with only 2 foot waves and beautiful sunny 80 degree temperatures. The ride out was a bit long but to get to where the fish are you have to go far. It took an hour and a half at 32 MPH we arrived at our destination. We were at 100 feet and marking fish, the hunt was on. The bait and rig are simple a heavy weight on the bottom and a snelled hook about a foot up. Using frozen sardines and cut bait from a past trip we were in the game. Fishing a 100 feet down on a rocky bottom we had bites right away. I hooked into one big fish, bigger than anything I have caught in years. It was a large Grouper weighing close to 20 pounds. There were so many fish trying to get our baits it was a job rebaiting our hooks. We caught grouper, snappers, yellow tail and a dozen of other fish. I have never heard of many of them but any fish on a hook is ok with me. It was a blast and when we finished we had nearly limits of the fish we were allowed to catch. A number of fish are not allowed in your catch for strict rules on length and some like red snapper were totally off limits. Although we caught a number of large Reds we let them all go. Some of these reds were very big weighing as much as 10 to 15 pounds. There is a season in the summer but not when we were there. After a great time on the water we headed back. But after the fun of catching those big fish the ride seemed short. Tyler and first mate Andy fileted our fish and we were done. A couple nights later everyone came over; we fried and broiled our fish at home and had a great feed. To contact Tyler call 941- 544-4089. This young Captain is one of the most passionate fishermen I have ever met. He specializes in Tarpon, Sharks, Goliath Grouper and all off shore species. Full or half days available and he advertises guaranteed to catch fish. You can see him on Facebook on his personal page: Tyler DeGraff or Always and Forever Charters. If you or anyone you know wants to catch a lot of fish when in South West Florida Tyler is your man. You won’t be disappointed believe me I wasn’t. Just a little info on coming to SW Florida. If you like warm weather there is no other place in the US that offers all the things we sportsman love. You can fish here every day and won’t freeze your tail off. But the biggest deal is the air fare. Allegiant air flies you right into Punta Gorda just 20 minutes from our front door step. We come down in the summer too for a week or so. If you look on the web for Allegiant air you can get one way tickets for 60 dollars sometimes. There are a lot of resorts and motels that have great rates. So for a quick getaway and not holding you up at the bank it’s a great deal. We have had friends from Illinois come down and stay so we have had the best of both worlds. If you need more specific information call me and I’ll give you some pointers. We will be here in Florida for the next couple of months enjoying the wonderful weather. We just love waking up listening to birds and drinking coffee on the Lanai. I just wish I would have pulled this off a long time ago. But we all need to spend our time working and preparing for this later in life experience. Being 65 and in relatively good health it still would have been more fun when I was younger. But if you are thinking about getting a place here do it now. There are some lots out in the country you can get for about $5000. People are coming here in droves; in fact they are building over 60 houses in a 4 mile radius. It’s time to plan and for that price it is a deal. I know a great realtor and she can help you find that perfect spot. Nina Whitman, 317-987-4115. Tell her Harry sent you. The here and now is always of critical importance. Lessons learned and accumulated experiences in life are what fortify us to be capable of making better choices and judgement calls each and every day. As a 70 year-old husband, father, grandfather and brother, my goal has always been to push my sensual radar to the maximum level of awareness so as to upgrade my quality of life constantly. Such dedicated attentiveness to primary priorities is the exact same system of considerations that benefit every endeavor we pursue, and that includes our deerhunting decisions. Walking on the wildside behind my dad, bow and arrow in hand in the big Michigan deerwoods as a little tyke taught me much, slowly but surely, about stealth and situational awareness. I bet if some sort of research could be determined, we would find that the most successful deerhunters are probably the most organized individuals in the world, and probably more often than not, the most successful overall in life. A hunter cannot casually stumble through the woods and expect to bag a deer. Comfortably numb does not a deerhunter make! I will never forget and forever cherish my 1st ever antlered whitetail with my bow. I remember every detail in stunning, vivid technicolor and graphic detail and relive it joyously often. I can actually taste it. Slurping a mug of hot joe well before dawn I exited the house onto a dark, cold, dank, misty driveway and felt the rare east wind cut into my cheek. I stopped short of the dog kennel and backed up away from the Bronco, sensing a certain feeling about the conditions this morning. I quickly abandoned my duck hunting plans and snuck back into the house without arousing the dogs and grabbed my Bear Kodiak recurve bow. Slowly walking past the barn, I instinctively headed due east into the wind across the road towards a large stand of mature timber beyond a series of alfalfa fields bordered by standing corn. Taking my time, I figured I would get to the woods right about shooting light and find a good ambush spot to intercept deer coming out of the corn. In the misty, pre-dawn dark, I entered the last hay field before the woods and barely caught the dark shapes of deer about 90 yards ahead. I immediately hit the dirt face down into the cold, wet, foot high alfalfa. With visibility light slowly approaching at about the same rate as the deer were closing in, I could make out antlers on the last animal. Squirming below the cover of alfalfa I eased an arrow onto the string sneaking a peak through the stems. As the first four does got slightly past my position the buck was now almost broadside at thirty some yards as I slowly rose from my shallow cover drawing my recurve simultaneously. Almost to one knee I came to anchor and burned a hole into the buck’s shoulder and let fly! I’ve loosed some mighty pretty arrows in my lifetime of bowhunting but none more beautiful than this aluminum shaft as the Bear Razorhead sliced perfectly into the pumpstation crease dead-center behind the buck’s shoulder! As he pivoted hard away, I could see my turkey feather fletching right there where it oughtta be! I melted back into the soggy alfalfa and watched in absolute awe as the buck covered fifty yards in a heartbeat and crashed just short of the woodline. I was 26 years old and had no idea what I was feeling at that moment. I had never felt anything like it before in my life. 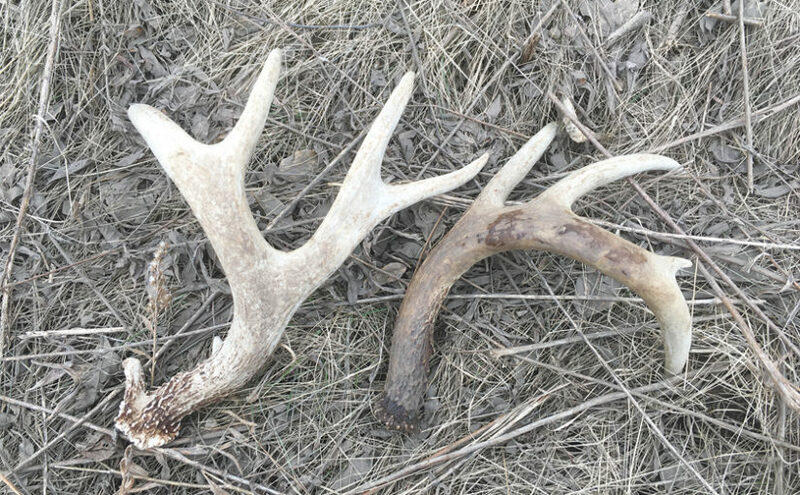 I approached the dead buck very slowly, literally feeling out of body as if I were hovering overhead watching myself walking through that wet hay field toward the fallen beast. I plopped down beside him and grabbed his stunning 12-point little rack and gazed disbelievingly at my dream buck. I then ran home faster than any deer has ever run and immediately called my dad, brothers, sister and a couple of my hunting buddies, excitedly sharing this magical deerhunting moment in time. I retrieved the beautiful beast in my Bronco and took one photo before gutting and hanging him. Writing about that moment still brings a Cheshire grin to my face and a deep, primal tingling deep inside. I swear to God that every time I’ve arrowed a deer since, I still get that phenomenal sensation as if it is the first time all over again. Hold onto those memories and never take this grand old game for granted. Savor every element of every hunt and take it all deep into your natural predator psyche. Relive and taste every stimulating moment and never let these exciting experiences get away from you. To be a hunter is a gift from God. Live it and celebrate it like you mean it. Visit www.HunterNation.org and be a force to reckon with for the future of this great sport/lifestyle and have the greatest hunting season of your lives. Madness in the Turkey Woods! 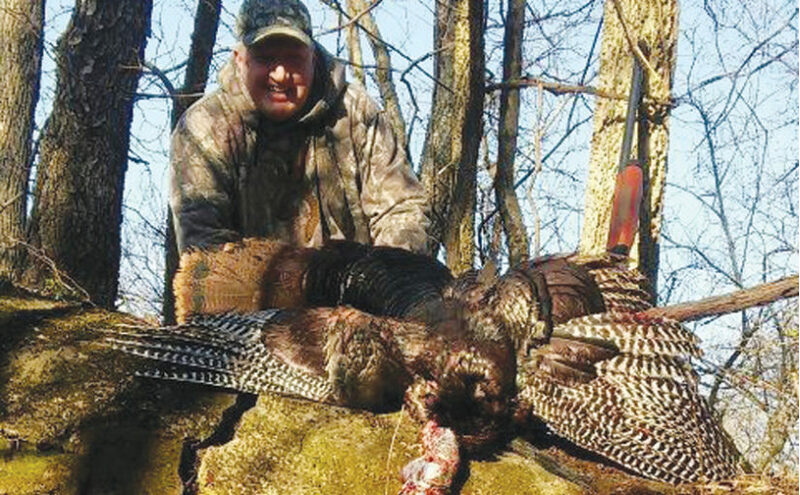 The pent up anticipation toward the Spring Turkey Season was soon to be relieved in reality. Two spots with a strong history of success were before me when exiting the truck, but rather than waiting to pick one based on vocalizations heard on the roost, the decision was made to make the spot further west. Continuing my trek toward this destination and after setting up against a Locust tree (trimmed of lethal spikes), a bird sounded off well to the East! So much for good luck on selecting my spot! Soon after light invaded the field, a bird sounded off to the North. Glad to hear turkeys but one being in a closer proximity would be better! Having no patience made fighting off the desire to work my calls to death difficult. Light tree calls and finally a fly down cackle were accomplished followed by silence. Now the sounds from the woods emanated from turkeys were subdued. Did the male of the species have more girlfriends than they could handle? Are they saving strength for later activities? Will this be a hunt counted as a learning experience? Being patient was tortuous! Suddenly multiple vocalizations from the Southeast caught my auditory attention. Was this a group of hens – suddenly a heavy gobble broke through the morning suns’ rays lifting my already sagging confidence! Multiple gobbles ensued! Keeping quiet was difficult but necessary. From the East a bird with his swinging beard walked in almost point blank. To swing the gun no matter how slowly would be probably impossible. We were only feet apart! Let him walk and move after he travels past! Another gobble sounded off closely. Not long thereafter, a foursome of males, all with visible beards appeared! Having let the first bird move out, was tough but this foursome surely would produce an opportunity! Two of the birds were in competition with each other – surmising this was the two elder birds of the flock, my concentration was on them! The two excited suitors pranced sideways in full strut making me nervous as they were already well within range but my gun barrel was not in pursuit yet. A group of mature birds, all within mere yards were now upon me! The most aggressive bird, now my focused target moved sideways – leveling the barrel in an awkward angle the trigger was pulled. The bird did not fold but ran! A quick second shot did no better! He took to flight into the woods but glided to the ground within eyesight. Now my perfect hunt was a total failure after having not less than five gobblers all within gun range! The surge of disappointment, anger and frustration combined to produce feelings of pure failure, only an idiot could produce this result! I reloaded and slowly trekked over to the edge of the woods to confirm no bird lay mortally motionless before me! Walking back to my spot was truly a walk of shame worse than a Coed after a night of debauchery without meaning could feel in the morning after in the walk back to her living quarters! Looking at the edge of the field, there before me appeared to be a bird, head alert but in a sitting or nesting position! He obviously could see me – hope sprung eternal. Don’t screw this up! I walked away as if disinterested but upon entering my hideout, circled around his spot and Indian stalked to within less than thirty yards from his position. The barrel was leveled ever so slowly and shot touched off! The bird was done! The bird, a fine specimen no doubt, was thanked for his sacrifice and my apologies for his tough demise. After organizing my turkey hunting goodies and tagging my prize, the journey out of the woods was made with the glow of success surrounding my person! I thanked our creator for my noticing the bird and being able to finish my previous shortcomings in success! Happiness through the pursuit of this bird returned to this Hunter with the vow to sharpen my abilities to avoid another scenario experienced this morning!